We are very pleased to announce that Ethereum Classic (ETC) is now available on our digital asset trading exchange. Our users across United Arab Emirates, Saudi Arabia, Kuwait, Bahrain, and Oman can now buy, sell and trade ETC with 0% transaction fees until August 31st, 2018. In order to start trading ETC, simply fund your account using our wire deposit option and place buy, sell, or market orders to start trading. What’s more, you can also trade our new digital asset pairs ETC–BTC, BCH–ETH, LTC–BTC, ZEC–BTC, ETH–BTC, XRP–BTC, and BCH–BTC on the BitOasis trading exchange. To start trading with the new digital asset pairs, simply visit our trading exchange. 1. The transaction fee discount offer is available for our users based in United Arab Emirates, Saudi Arabia, Kuwait, Bahrain, and Oman only. 3. 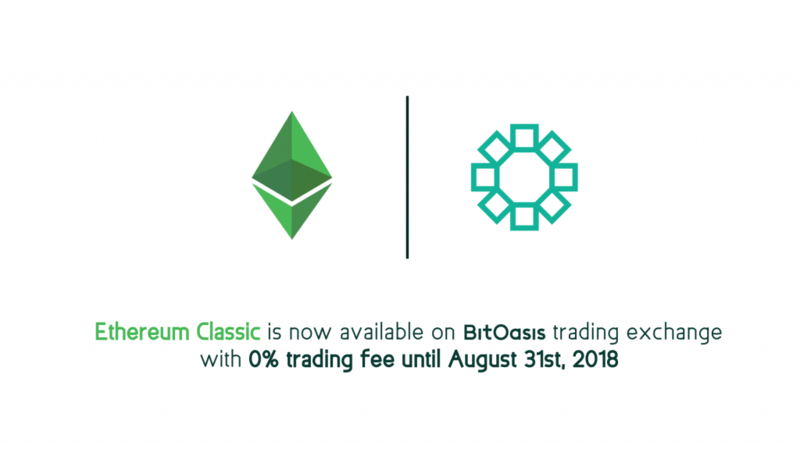 This offer is only available on the Exchange platform and is not valid on the BitOasis wallet. 4. This offer is valid until August 31st, 2018.